Ingrid Bergman was one of the first fair faces to grace the silver screen at the Cape Charles Palace Theater. Today, the former movie house turned live arts performance hall houses Arts Enter, a non-profit organization that promotes theater, dance, music, and the visual arts. Arts Enter first began work on the historic building over a decade ago. The restoration has been a thoughtful one: the building’s two historic murals were completely refurbished, the stage was slightly expanded to allow for greater movement, and disintegrating theater seats were replaced with wider chairs for a modern audience. An art gallery was established in the front of the building and a dance studio installed upstairs. The theater retains many of its eye-catching Art-Deco features, such as a set of double leaf doors with bubble-like circular panes. Thankfully, these were in good condition at the outset of the project. Other items required serious repairs. One of the major thrusts of the renovation included replacing the building’s disintegrating marquee, which was in such poor structural condition that it could not be saved. Over previous decades, the feature had been mended so many times that little historic material remained. The ticket window near the building’s entrance also received new glass, as former panes were broken. 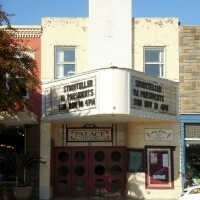 CPG received the final tax credit approval on the Palace Theater in 2013. However, the building may restart renovations sometime in the future, as Arts Enter continues to expand on their mission of bringing first class arts to the town of Cape Charles.